Bjørn Melhus´ video installation “FIGHTING THE FORCES OF EVIL” is a sound collage made from snippets of american war movies and creates an abstract “Gesamtbild” of light and sound. This work denies the single, singular image and rather aims to generate an overall picture made of light colour fields. The result resembles a light pixel that has been blown up by a microscope to be reformated into the size for the exhibition space. The newly assembled collage of sound fragments, that are used, were taken mainly from American war films and, on the one hand, are expressions of manliness, camaraderie and death, on the other however, it deals with affirmative action and entertaining moments, which have been increasingly perfected while developing special-effects cinema over the past two decades as a strategy of militainment. The dramaturgical arc is fragmented like in TV. The sequences are fragmented by jingles, snippets of roaring good mood, that chop up the continuous story into short menus. FIGHTING THE FORCES OF EVIL is the title of a two-channel video installation by Bjørn Melhus, which is the result of the work, STILL MEN OUT THERE, in the Autumn of 2003. Six television sets are lying on the ground, the screens of which are facing upwards, their arrangement is reminiscent of a blossom or a target. In fields of changing colour, these televisions tell a story about fighting the forces of evil and immerse the ambient space in a light and sound spectacle. The newly assembled collage of sound fragments, that are used, were taken mainly from American war films and, on the one hand, are expressions of manliness, camaraderie and death, on the other however, it deals with affirmative action and entertaining moments, which have been increasingly perfected while developing special-effects cinema over the past two decades as a strategy of militainment*. FIGHTING THE FORCES OF EVIL, as well as STILL MEN OUT THERE, are rather more confrontations with the fictitious representation of war within an existing entertainment culture, than works on war. The complete absence of the artist is significant, when compared with earlier works by Melhus,. It seems as if the figures created over the past 12 years have returned to that point, from whence they once came, i.e. into the light of the cathode-ray tube. In the early video, DAS ZAUBERGLAS (1991), for the first time, a mirrored image of the medium has appeared as a conceptual desire from white noise, the sum of all waves. By using analogous signal splitting in the film, WEIT WEIT WEG (1995), the images of a “Tele-Dorothy” multiplied themselves in the form of an electronic and then ultimately fading echo. In contrast to this, the digital clones of its own image were able to multiply infinitely in AGAIN & AGAIN (1998) without loss of quality, an aspect, which is then assumed by the exclusive presentation of the video on eight serially connected screens, thus making the picture the overall ornamentation. The multiplication of image finds its pinnacle in the monitor wall of PRIMETIME (2001). However, the ornamentation changes increasingly into an abstract play of light and thereby turning the viewing apparatus into bodies of light in self-observation. 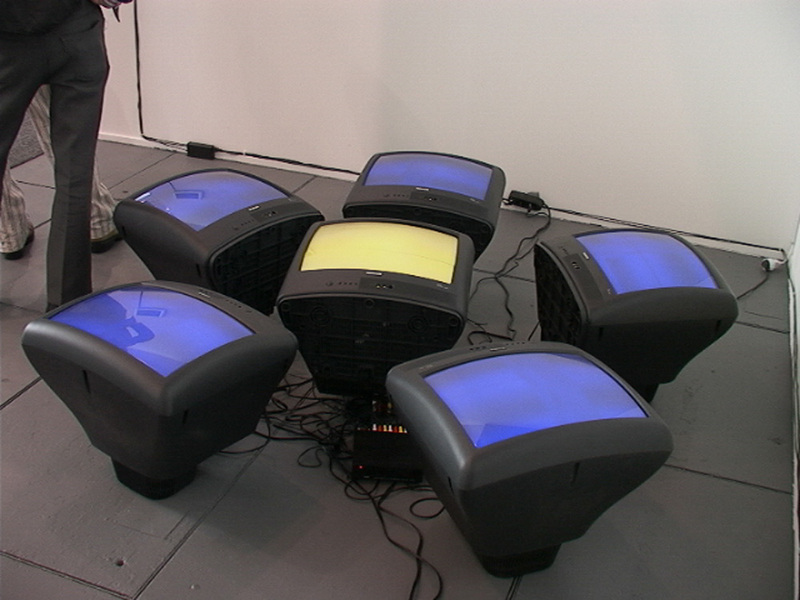 In the installation, SOMETIMES (2002), the monitors, which are lying on the floor, assume only the function of a speaking light source and determine the colour field, in which the four projected protagonists are located. In dialogue with the voice of light, the figures fade, which already appear, as such, as indifferent hulls lacking identity and, as media in the parapsychological sense, embody changing voices. With the work, STILL MEN OUT THERE and FIGHTING THE FORCES OF EVIL, Melhus succeeded in taking the ultimate step toward the voice’s disembodiment, which is the return and dissolution of its own image into the light of the screen. Perhaps the simple word, still, in the title is an indication that Melhus’ men shall return one day – dead or alive. While they cannot be shown in one single image, the sum of the light fields appears like the microscopic section of a display, upon which light pixels are constantly formed anew. In the changing play of colour, impressive moments are consciously constructed such as the simplified representation of a rotor or an explosion, which then become a pure battle of light in their repetition. Nonetheless, in the film without pictures, the stimulation of the retina seems to generate its own images. Images that lie within us and refer back to the remembered fictional representation of war. While the 18-part installation, STILL MEN OUT THERE, in its extensive arrangement and complex narration, exhibits an almost cinematographical character, the structure of FIGHTING THE FORCES OF EVIL conforms rather to television format. The sequences are fragmented by jingles, snippets of roaring good mood, that chop up the continuous story into short menus. “Life is a Party – everywhere!” And life appears to be everywhere, also in death. The more the Pentagon and the American entertainment industry collaborate directly, the more war turns into Rock ‘n Roll. Fighting the powers of evil, whether in the cinema or on television, becomes a lucrative business for both sides. Thus, also the strategy of embedded journalism guarantees the powers of good maximum ratings and in addition supplies the military apparatus with new recruits, as well as necessary authentication. The only important thing is to be on the right side. Let’s roll!